Dependable. Deployable. Under any circumstance. Versatile and flexible, the Universal Weapons Rack was created with one goal in mind—to be the best weapons storage system for operational readiness. Save Time. Save Storage Space. Increase Security of Weapons. Most optics and accessories can remain assembled and zeroed to weapons while being stored—and perforated doors and sides make weapons inventory assessments easy. And, in the case of deployment, there’s no need to transfer weapons to a different rack. 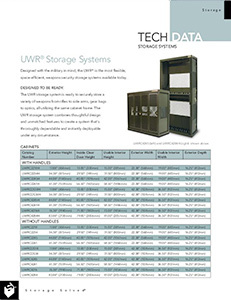 The fully retractable doors of the UWR allow for smaller aisles in your space, opening up room for additional inventory. Weapons racks can also be stacked and ganged together without welding or chains—and can be utilized with a high-density mobile storage system to conserve even more space. 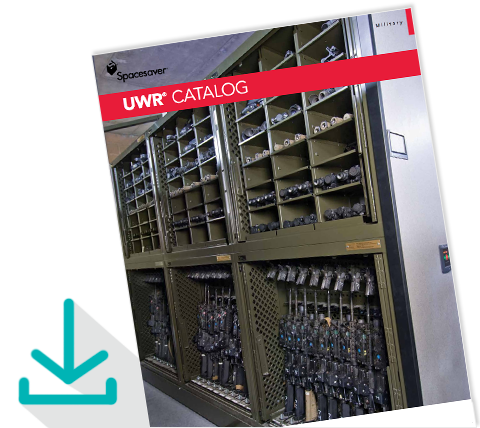 The UWR system completely prevents weapons from movement, vibration, shock, and abrasion. 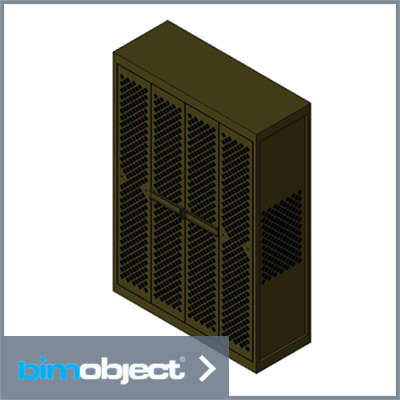 The ability to store multiple weapons in one system, and do so without the need to disassemble or zero the weapon in a huge boost to your operational and combat readiness. 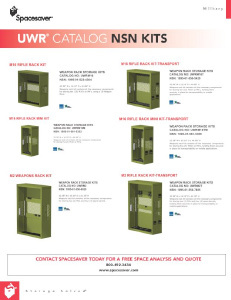 See this 60+ page Universal Weapon Rack catalog for kitted cabinets and components. 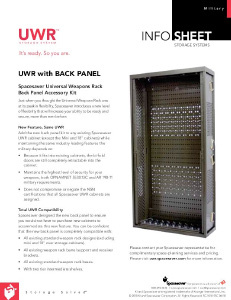 The Universal® Weapon Rack (UWR®) combines thoughtful design and unmatched features to create a system that’s thoroughly dependable and instantly deployable under any circumstance. 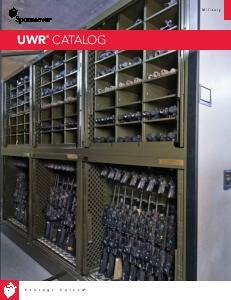 Keeping operational readiness in mind, the Universal Weapons Rack storage system is both versatile and flexible. 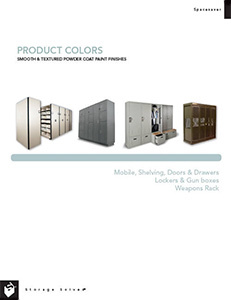 Adjustable racks accommodate weapons of various lengths and types, and perforated doors and sides simplify weapons inventory assessments, while keeping weapons storage highly secure. 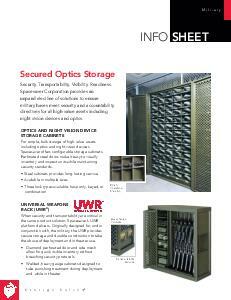 Most optics and accessories can remain assembled and zeroed to the weapon while being stored. The Spacesaver UWR completely prevents weapons from movement, vibration, shock and abrasion. All of our transport components passed accidental shock and load tests by keeping weapons safe and secure. 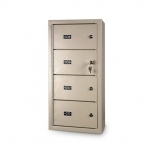 The weapons storage system can be tilted 90 degrees in any direction without weapon becoming dislodged, or coming in contact with each other or with other components in the rack. 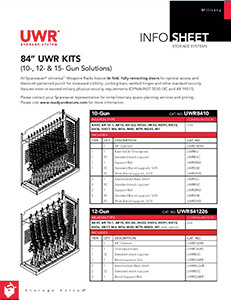 Offering the same features as the standard Universal Weapon Rack storage system, the UWRmini® storage system is just as flexible and versatile. With the same depth and four standard heights, at 22.38″ (568mm) wide the UWRmini weapons storage system checks in at slightly over half the width of the standard weapons rack. Its decreased width and weight make physical transport much easier than a full-size Universal Weapons Rack storage system. 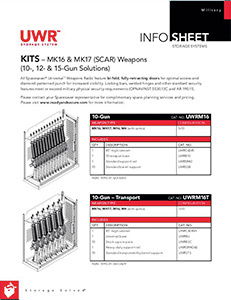 The UWRmini weapons storage system is also ideal for maximizing space inside transport containers and arms rooms where every cubic inch counts.